Madam only a lier, but a thief??? -Un-freaking-believable, that's what it is! Why is it wrong? No one seems to care how much money Trump has and how he got it but the Clinton's money well that's another story. Many former presidents and Congress people have made millions on speeches but that's ok? I think there is a double standard here. I would certainly not vote for her. Disgusting! Noted. Thanks for posting, Judy. Well, that was a real eye-opener! Although I am voting for Bernie, I have always been open-minded regarding Hillary. But, this stinks to high heaven. At this point, I think she should be satisfied that she has been First Lady of Arkansas, First Lady of the U.S., a Sen. from N.Y., and Sec. of State. Not failing to mention that, at least at the time of the wedding, her son-in-law was in the hedge fund business. Will it ever be enough for Hillary? And that is one of the reasons I will vote for her if I have to . i n the primary I will vote for Bernie; in the end sadly I usually end up voting for the lesser of two evils. She may not be evil but she is sketchy in many areas. Most people know that Hilary is part of the establishment so it should not be a big surprise. However, if I lived in the U.S. and she was picked to run, I would sure vote for her over Trump or any Republican. Most politicians get paid to speak in the U.S. or in Canada or likely all countries. I think Bernie is great and would love to see him win it all.....but I bet he has been paid for some speeches in his lifetime. The banks and the financial industry are the underlying cause of the mess we're in today economically. The fact that they are willing to pay out this kind of money to hear Hillary Clinton speak should tell us what she is about, regardless of what she says about being "for the people". These actions do not back up her words. This about-face is certainly not believable, at all. 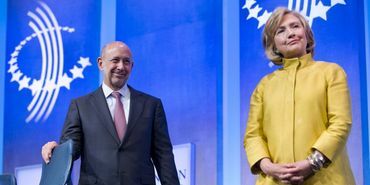 Hillary is NOT going to stand up to Wall St and the Banksters she has already said she isn't going to place on Glass-Steagall. She is only sounding as left as she is because she saw how many people were flocking to Bernie. She'll say anything to get elected. She wants to be the first woman President, she wants to be a first husband and wife team for President, she always felt Obama stole her thunder.....this race is for HER. You want someone that will work for you......vote Bernie Sanders. This is your biggest chance for you, your children and grandchildren to start to pull this economy over to work for you. If you don't vote for Bernie it isn't going to change, it will be more of the same or worse. This is a one time shot at this.....don't let it pass you by. Don't have your children and grandchildren look at you and ask why. ZBoughtout corporate WHORE.....and people actually believe she will reign in these POS's.....HA! They own her.